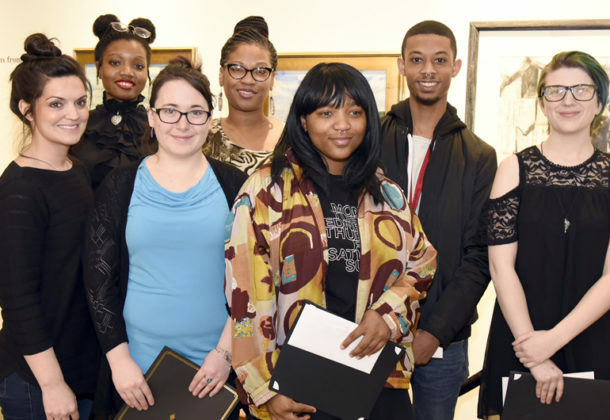 The College of Southern Maryland Art Award Program recipients from left are Laura Mickus, Melanie Williams, Kathrynn Pickering, Monic Coppedge, Asia Rodgers, Bernard Dickens III, and Kelsey Crum. About 60 College of Southern Maryland art students were part of the college’s 2018 Annual Juried Student Exhibition, and eight of the students earned awards for their work. Kelsey Crum, 19, of Owings was awarded the top prize in the show: the Juror’s Prize. Ms. Crum recently made a life-changing choice about her future. After years of interest in engineering and robotics, Ms. Crum realized that for her, another other ongoing passion was taking a deeper hold. Ms. Crum changed her major from engineering to art. That decision was positively affirmed when she won the award, and at 19, the 2017 graduate from Northern High School, was the youngest winner in this year’s competition. The Juror’s Prize goes to the one work that makes the biggest impression on the juror, who, this year, was Northern Virginia Community College art professor Matthew Pinney, a Washington, DC, metropolitan-area artist who has exhibits extensively in the region. Ms. Crum’s Juror’s Prize-winning work was a ceramic figure of a gray lion with a human face, she titled “Sphinx.” As a neophyte in the medium, she had just begun working with ceramics during a CSM class in the spring semester. Bailie Anthony of Mechanicsville and Kathrynn Pickering of La Plata received honorable mention awards: Ms. Anthony for a small, untitled oil on canvas painting with a landscape of trees and sky, and Ms. Pickering for “Reflecting Hibiscus,” a gouache and acrylic work of vivid color. The CSM full-time art faculty also selected two items from the show to buy for the CSM Fine Arts Department Collection. A ceramic piece, titled “Her Favorite Shoe,” by Accokeek resident Melanie Williams and a photo titled, “Praying,” by Waldorf resident Laura Mickus were bought. Ms. Williams was new to ceramics this semester and was “just floored by the reaction” to her work. “It lets me know I’ve learned something, which is really great,” she said. Ms. Mickus’ said her black and white photo was shot at a local laundromat. She said she first took the photo because it made her nostalgic — she remembers playing in the laundromat when she was young and she enjoyed her time there. However, after Mickus watched other students’ very different reactions to the photo, she titled it “Praying” to acknowledge some customers might wish they were in a better position and not have to use a laundromat. Four recipients of the Walter B. Grove II Memorial Art Scholarship were announced during the reception. The scholarship for CSM art students was established by Jane and Walter Grove in memory of their son Walter, who had been an art student at CSM. “They really are the great benefactors of the arts here at CSM and all over Southern Maryland,” said Professor George Bedell at the ceremony, acknowledging the Grove family, who were in attendance. The CSM Foundation, which oversees this scholarship fund, was also thanked for its efforts on behalf of student success and the arts at the college. This year’s Grove Scholars are Mickus, Liane Beckley of Upper Marlboro, Lucas Snyder of La Plata, and Nicole Tomasic of Leonardtown. “They were evaluated on their breadth as artist and students,” Mr. Bedell said of the scholarship recipients. Ms. Tomasic said that being selected for the scholarship was particularly affirming because she, like Ms. Crum, changed her major from engineering to art, with an emphasis on photography. For more on the gallery and its exhibit schedule, visit CSM’s arts website. For more about opportunities to support CSM students through scholarships, visit the CSM Foundation. To view photos from the CSM 2018 Annual Juried Student Exhibition Reception, visit CSM’s photo sharing site.